The Best Basement Designs-A finished basement has endless potential. From a bedroom to a studio apartment to the coveted “mancave,” finishing your basement not only adds value to your home, but also a lot of functional square footage for the whole family. Once you’ve considered the basics of finishing a basement, it’s time to decide how you want to use the space. At first glance, you’d probably never guess that this gorgeous studio apartment from April Force Pardoeis actually a basement. It has the character, charm (and natural light!) that most of us only dream of, and makes a perfect in-law suite or rental space. Whether you’re hoping to make a little extra income out of your unused basement or you want a place to make family memories, we’ve rounded up a few more of our favorite finished basement designs. The Perfect Mancave-If you’re dreaming of the perfect recreational basement, designer Kerricolfer created the mancave to end them all. Complete with a full bar, a TV room and a pool table, this space is perfect for Sunday football games or catching up with family and friends over a few drinks. When considering a renovation of your basement, a multipurpose room can be a great way to entertain guests and create an escape from the rest of the house. Create an Enviable Teen Bedroom-Want to give your teenager a little more privacy? This gorgeous teenage oasis created by Larson Design Interiors is an attractive way to move your teen to a basement bedroom and create a space that can host both homework study groups and Saturday night movie marathons. The throwback macramehammock chair adds a little bit of whimsy to the rest of the room’s mature and chic vibe. The Dreamiest Playroom-What’s better than a child’s playroom? A child’s playroom with a built-in climbing wall. This innovative basement design by Studio Nuovo is everything kids’ dreams are made of. Not only will you add a fun space for your kids to play in (and for those piles of toys to live), you’ll have a great way to get out pent-up energy on those long, rainy Saturdays.Continue to 5 of 15 below. 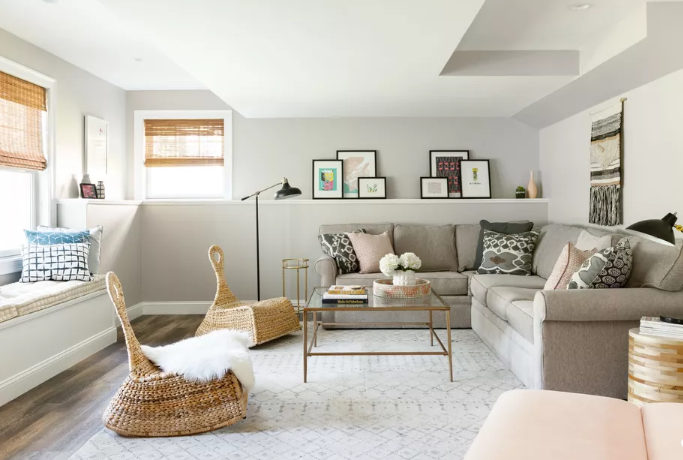 A Second Cozy Living Space-You’ve probably already considered a basement design that offers a second living room, but this finished basement from E. Lynn Design is so nice we can’t imagine ever leaving it. The rustic modern farmhouse look is miles away from a dingy, dank basement. Instead, the monochromatic palate is refreshing and airy. Even more refreshing? That cafe-style beverage fridge, so you don’t even need to trek to the kitchen for a drink.